I guess everybody has their own thing that they yell into a well. The scales of justice cannot function unless the whole truth is placed upon them. Whether or not our faulty systems, set up to honor the colonizing, rich, white, and male, recognize what hangs in the balance, our souls do. It is the health of our consciousness that is weighed now. And always. In these circumstances, to feel out of balance is an honest assessment of the corruption we are weighed against. In times like these our pain, and also our numbness, is a marker of our health, not our illness. As for me, I have been spending every night under a well-designed beanbag that’s one-sixth of my body weight, marvelling at capitalism’s ability to create a void and then to fill it, for those who have the cash. I am moving to São Paulo. I would say that I have never moved to a city knowing so little about it, but seven years ago I moved to Charlotte because I thought it was Charleston. It is the largest city in the southern hemisphere. It is not the capital of Brazil. It is made of many neighborhoods and we will probably live in Vila Madalena or Pinheiros, both referred to as the “Brooklyn” of São Paulo. There is actually a neighborhood in São Paulo called Brooklin but it is not the “Brooklyn” of São Paulo. It is the third largest Italian city in the world outside of Rome and Milan. It has the largest Japanese population outside of Japan. It is home to a hella diverse food scene. The traffic is pretty bad. The weather is perfect enough that I will be able to figure out if I get sad every year because it’s cold and dreary (as I have suspected) or for other reasons (that I will entertain if needed after a year with a warm winter). We can probably afford a place with a balcony. There is no point in making a list of things I don’t know about São Paulo. 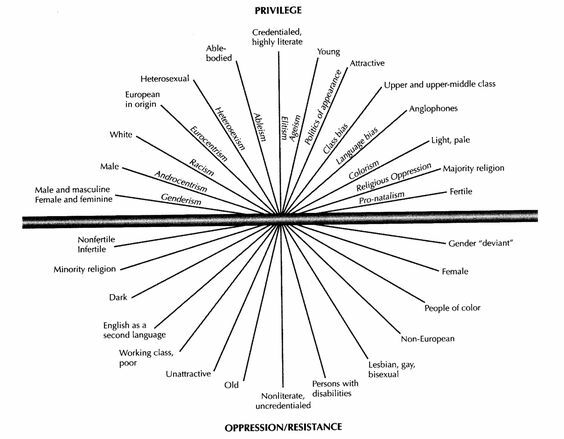 This helpful lil graphic on continua of privilege. Beyoncé’s pregnant-with-twins aesthetic is hitting me in all the right spots–flowers, black royalty, Frida Kahlo vibes. A last minute trip to Trinidad will do the soul good. An episode of The Splendid Table in which a Sri Lankan baker named Samantha is interviewed about her use of spice in baking + Matt Goulding discusses shokunin + Alex Stupak from our favvy Empellon al Pastor talks through his tortilla recipe. Our politics initially sprang from the shared belief that Black women are inherently valuable, that our liberation is a necessity not as an adjunct to somebody else’s may because of our need as human persons for autonomy. This may seem so obvious as to sound simplistic, but it is apparent that no other ostensibly progressive movement has ever consIdered our specific oppression as a priority or worked seriously for the ending of that oppression…. We realize that the only people who care enough about us to work consistently for our liberation are us. Our politics evolve from a healthy love for ourselves, our sisters and our community which allows us to continue our struggle and work.